Catching the last five minutes of Eric Schmidt’s Boston University commencement speech on WBUR I was struck by the veiled swipes (pokes?) he took at Facebook(s fb). You know, the company that last week launched the most anticipated IPO in years, and that despite NASDAQ glitches and a disappointing finish, wiped Google out of the record books? Yes, that Facebook. Apparently, a captain of industry like Google’s (s goog) executive chairman, never lets the chance to sell his company or tweak his rival go untaken. So even though he never uttered the “F word,” everyone got the message. Schmidt also told the new graduates to be sure to turn off their computers for at least an hour a day — a line that got the biggest roar out of the crowd. Eric Schmidt at BU: take one hour a day and turn off all devices. Really connect. For the last few years, Google and Facebook have been locked in heated competition for the best talent in Silicon Valley and beyond. The noise around Facebook’s IPO contributed to the impression that Google, which went public in a then-record breaking 2004 IPO, is a has-been. That perception hurts. No wonder Schmidt got his digs in. Unless this is somehow coded, like playing a Beatles record backwards to find out whether Paul is dead, I think you are rationalizing with your own preconceived point. Google a has-been? Google innovates much more and makes the world better through its services and platforms. Facebook is a closed environment that only wants you to waste more of your time on their website so they could use your data to push more ads to you. not saying Google is a has-been. Just that the mentality in the Valley seems to be that Google is a has been…. google remains huge and hugely important, of course. Rhetorical question: Which Valley are you talking? Serious question: Are you serious? I was at the commencement and there were no digs at Facebook, veiled or otherwise. His speech was largely about advising the graduates to open their minds to new possibilities and say yes to opportunity more often than say no. He told them that they are the generation that is more connected to each other and the rest of the world than any other before them and that they have the chance to change things in a more profound way because of it. Any references to Facebook or Google products were said with humor and not with any pointed argument for or against one or the other. I believe it was a very good commencement speech. you don’t think the reverences to the like button and friend counts were digs at Facebook? I do. I don’t see why Google would make a dig at Facebook’s Like function when their own Google+ has a +1 function. If anything, Schmidt was making a good point that people spend too much time online or in front of their TV or gaming console or whatever else. Mentioning Likes and friend counts are a good way to reach his audience (university students) and get this point across. > you donâ€™t think the reverences to the like button and friend counts were digs at Facebook? I do. I bet you do. Cuz you needed material for a pointless post! If Eric Schmidt had made references to the +1 button and Circle counts, I bet you would have a sarcastic article about how he is trying to plug G+. 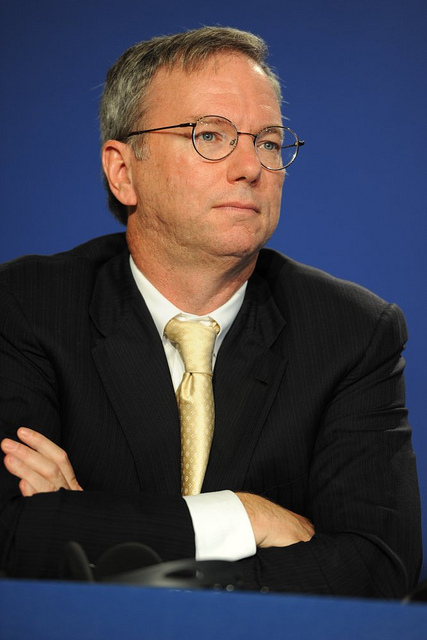 If YOU had to give a speech in which you had to make the same references to social media that Eric Schmidt did, would you use references to ‘like button’ and ‘friend counts’? I am sure I would. Why? Simply because FB is the largest social network out there. So, it’s natural to use the terminology used on FB, even though I am talking about social networks in general.